For many of us, heavyweight software samplers play a leading role in the studio. They handle our sound libraries of course, but can also be a platform for browsing, playing and manipulating audio loops, and for the most complex and creative sound design. MachFive has a history stretching back to 2004. It's not solely developed by MOTU, but also by the French company Univers Sons, aka UVI or Ultimate Sound Bank — they go by a few names! They're behind MOTU's other sampled virtual instruments too, but more of that later. 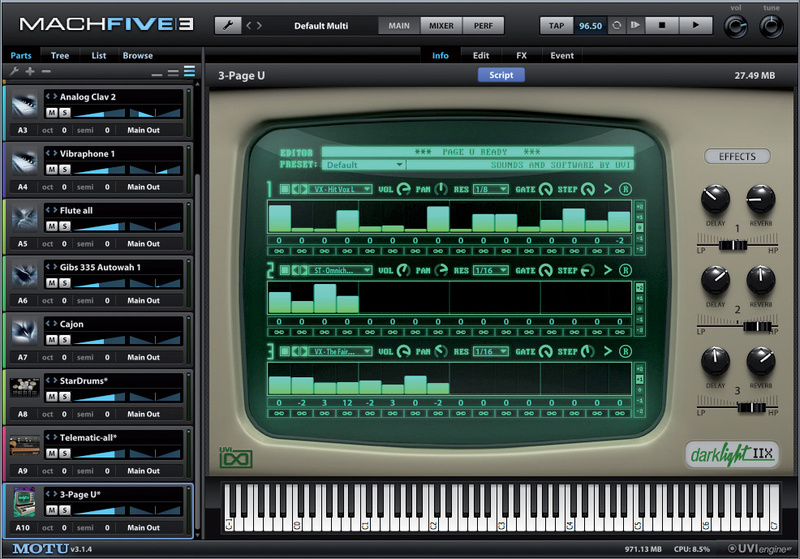 The current version, MachFive 3, runs on Windows and Mac OS as a stand-alone application, and also as a DAW plug-in in all the usual major formats. If your DAW is 64-bit then MachFive is too, with all the memory-addressing advantages that go with it. Exploring programs from the bundled library soundbanks, and also the file structure of your drives, is achieved via an interactive browser overlay. Like much of the software sampler competition, MachFive 3 is a pretty complex, 'deep' instrument. A detailed description of every single aspect is beyond the scope of this review, although I'll do my best to cover all the juicy bits. To get things going, I thought I'd attack MachFive as the majority of end users will, starting with its interface, the bundled sound library, and the fundamentals of loading and tweaking sounds. Firing up either the stand-alone or plug-in version, you're presented with the same basic user interface: a list of 'parts' in a left sidebar, a multi-purpose Display Area to the right, a Master Section along the top, and a narrow Status Bar along the bottom. In the stand-alone app and some DAW hosts, the window is continuously resizable upwards from approximately 980 x 680 pixels. Four preset sizes are also available from a Master Section pop-up. The on-board mixer has one channel per part, four Auxes and a Master — all with unlimited effects inserts. 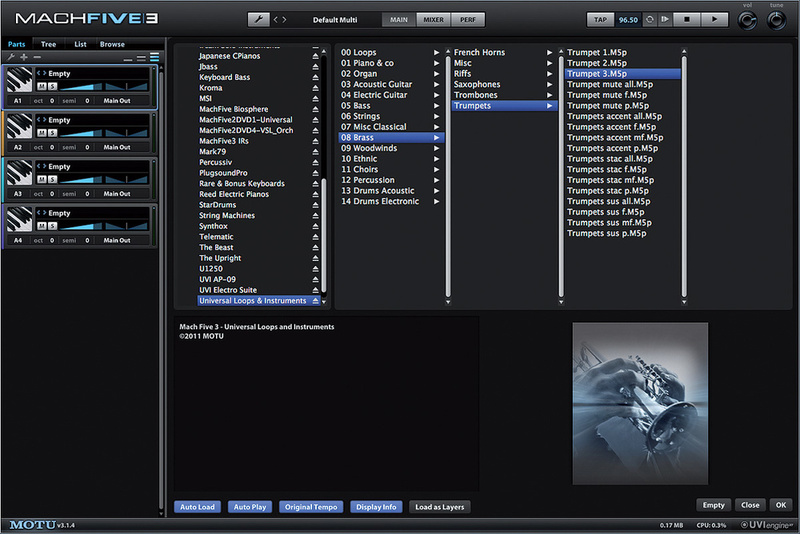 Above, there's an area dedicated to effects editing.Loading a sound into MachFive is easy: you begin by double-clicking one of the part names, and then either drill down into your libraries or computer file system using a multi-column browser, or use an indexed Search feature. Multiple parts can be configured without leaving the browser, and there's extensive drag-and-drop and right-click functionality, too. How you actually then play or 'drive' your loaded parts is up to you. MachFive is massively multitimbral — there's no limit (other than your CPU power, of course) to the number of parts you can have going concurrently, and any of them can respond to one of 64 incoming MIDI channels (or all at once, via an Omni setting). A single MachFive instance could support an entire orchestral template, or you could run several carrying just one part (or a few parts) each. If you choose the multitimbral approach, but like to balance parts in your DAW's mixer, the 16 stereo audio outputs alongside the Main Out let you do that. Otherwise, there's a built-in mixer that presents each part as an individual channel strip. Four auxes and a master channel provide a good functional mix architecture, and you can add native effects via insert slots above channel faders and pans. Speaking of effects, I counted 62 different types, and they span pretty much the whole processing gamut (check out the 'MachFive Effects' box for a more detailed look). Chains of effects can be unlimited in length, and you can easily re-order them and save or recall them as an effects 'multi'. The 2.9GB Star Drums soundbank is based on a Tama Starclassic drum kit.In fact, the entire shebang of parts, mixer settings and effects, of any complexity you like, can also be stored and recalled as a Multi. Live-oriented users can also switch to a dedicated Performance view there, too, and set up complex layers, splits and keyswitched programs that have the potential to see them through entire sets. Going hand in hand with MachFive's 'universal' moniker is a hefty sound library that aims to cover all bases, delivered in the form of 10 separate UFS (universal file system) soundbanks. It's not compulsory, incidentally, to install all (or indeed any) of them. 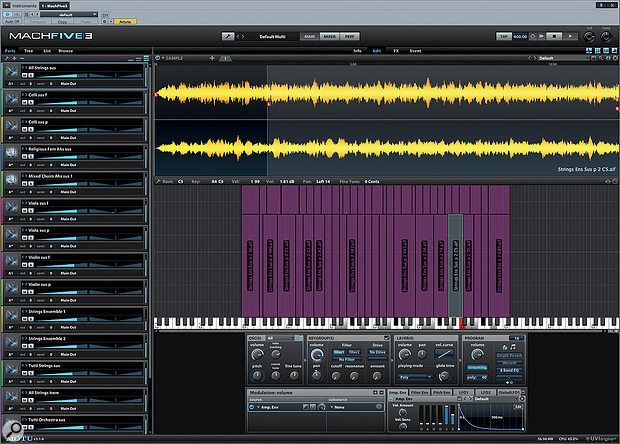 The bedrock is the almost 6GB-strong Universal Loops & Instruments soundbank. 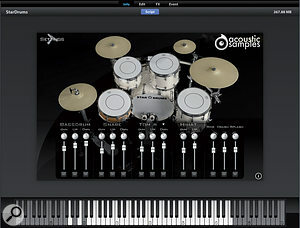 This groups hundreds of instrumental sounds (which, in MachFive, are properly called 'programs') into 14 categories (visible in the screenshot at the top of this review), plus a separate one for drum loops. There's a lot of fine material on offer; a range of multisampled acoustic and electric pianos, clavinets, mallet instruments, solo and section strings, some really excellent woodwind and brass with variations that'll span classical and more popular styles, choirs, ethnic instruments... the list goes on. 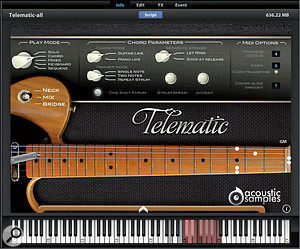 The Telematic soundbank comprises 8.3GB of lovingly sampled Fender Telecaster.On the whole, this all-rounder soundbank is of very high quality; bright, contemporary, clear and classy. The drum loops are a distinct cut above the average (some in the Trip-Hop category are real works of art) and there's a good range of acoustic and electronic kits on offer too. However, there's unevenness in places; I heard some bum clarinet notes, some 'sus' articulations that actually don't sustain, a flute sample where someone accidentally hits a mic stand, and harps and pianos that sustain indefinitely! Perhaps the most unwelcome feature is that many brass and woodwind instruments load with a drunken-sounding portamento enabled. The Macro switch to turn it off, in MachFive's Info view, sometimes fails to appear until you click in and out of another editing view. It's a bug in the interface, as opposed to the individual sounds, but it's still a drag. I don't want to overstate these little gremlins, though; they're heavily outweighed by huge quantities of extremely fine, playable programs. The Slice oscillator type gives you Recycle-style handling of looped audio. Entire loops can be MIDI-triggered or automatically sync'ed with your DAW's playback, or the individual slices can be converted to multiple separate Sample keygroups. You can also drag the audio and MIDI event-timing results directly into DAW tracks.If you're wondering about synths, they get a soundbank of their own: the 2.2GB MachFive Biosphere. Hundreds of programs are arranged into familiar categories such as Keys, Leads and Pads and the range of timbres on offer is impressive, with (apparently) about equal respect for synths from each of the last four decades, analogue and digital. What helps here is that MachFive isn't just a sampler; its synth architecture and broad range of filter characteristics are very much part of the sound on offer. 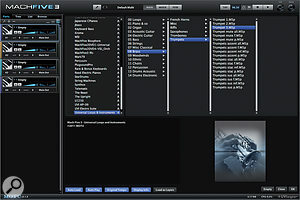 X-TremeFX, a soundbank of "sound effects, foleys and atmospheric sounds”, comes in at just over 9GB. I'm not sure it could ever replace an online sound library, or make much of a dent in a foley artist's personal collection, but there is remarkable variety on offer. Some programs are pitched and tuned, and have musical applications. Others are noises pure and simple, ranging from natural ambiences to the most electronically mangled textures imaginable. The remaining soundbanks are of a rather different nature. Instead of offering huge range and flexibility, they present single instruments that have been massively multisampled and subsequently scripted to enhance playability and the sense of realism. IRCAM Stretch is MachFive's most CPU-indulgent time-stretch (and pitch-shift) oscillator, but it gives very good results on a wide range of audio — even track-length mixes.Take 'The Upright', for example. A plucked upright bass that runs to 2.5GB, it includes overhead and close-miked variations, and a DI'd version. The main thing is that it's just one bass, pure and simple. The main attraction here is the default 'hammered' playing style where, in appropriate musical circumstances, ongoing MIDI note triggers cause the string to sound as if it was just stopped, not replucked. This emulates a real-world playing style with an extraordinary sense of realism, enhanced further by keyswitched harmonics, a nice, noisy slap option, and a range of palm mute and string/body noise triggers. The 1.7GB J-Bass (based on a Fender Jazz Bass) does something very similar. Instead of multiple mic positions, though, there are four distinct playing styles: Finger, Pick, Muted and Pick Muted. A simple Cabinet (speaker) on/off switch chooses between a DI sound and a big, slightly dirty room sound. But there's more subtlety here than you might think; click into the effects edit view and you can blend the two or choose from many amp and mic types, thanks to the Guitar Boxes effect type. Generally, it's not the cleanest sound, so it's probably best suited for mainstream rock, and when it's combined with other instruments I fancy the intonation is a touch sharp in the lowest registers. Still, the potential is there for this sampled instrument to underpin album-length projects without anyone guessing it wasn't a real bass. It's not how big it is, but what you do with it: the synth architecture belonging to every single keygroup is amazingly flexible, supporting unlimited modulation assignments.M53's two piano soundbanks — the Fazioli F278-based F Grand and 1979 Fender Rhodes Mark II Mark 79 — weigh in at 6.7GB and 7.5GB respectively. The Fazioli is a full-bodied thing, voiced quite energetically. It's a super-classy pop and rock piano but doesn't, I think, challenge any of the specialist piano libraries for solo classical use; its lower dynamic levels are not as silky or caressing as some, and there's no specific sympathetic resonance behaviour. However, the pedal-down resonance and key noises are very authentic, and in a mix it'd be fantastic. The Rhodes, on the other hand, is good by any standards. Soft playing is rewarded with a warm and present timbre that could launch a dozen ballads. More edgy, 'soloistic' styles are taken care of with a fine-sounding default Distortion and Cabinet emulation, and cranking up the Acoustic volume a little gets you that ratty, rattly sound of a well-used and ageing instrument, which can be so evocative and earthy. 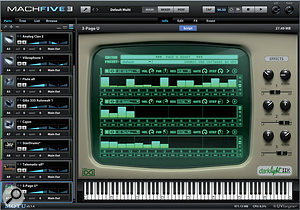 MachFive offers a wide range of synth-style filters. Top of the tree is an emulation of the filter section of Oberheim's Xpander synth module, which is equipped with no fewer than 37 filter types and combinations.Moving on, the 2.9GB Star Drums is a Tama Starclassic drum set, in natural, processed and multi-output versions, with stereo or mono overheads, and multiple spot-mic positions. Although this rich, open, ringing kit isn't going to suit every project, the capture quality and multisampling is glorious, and there's clearly a lot of round-robin sample-switching going on. The 1.2GB Percussiv I found perplexing. This is your standard Latin percussion line-up — multiple claves, shakers, woodblocks, bongos and more, mapped out over a wide keyboard range. The capture quality is superb, but the minimalist user interface is dysfunctional; you have to choose instrument types individually from a pop-up menu if you want to adjust their volume, pan and pitch, but as soon as another MIDI event is received, that menu instantly reverts back to Agogo! It's also impossible to set different pan positions and levels for multiple instruments of the same type. 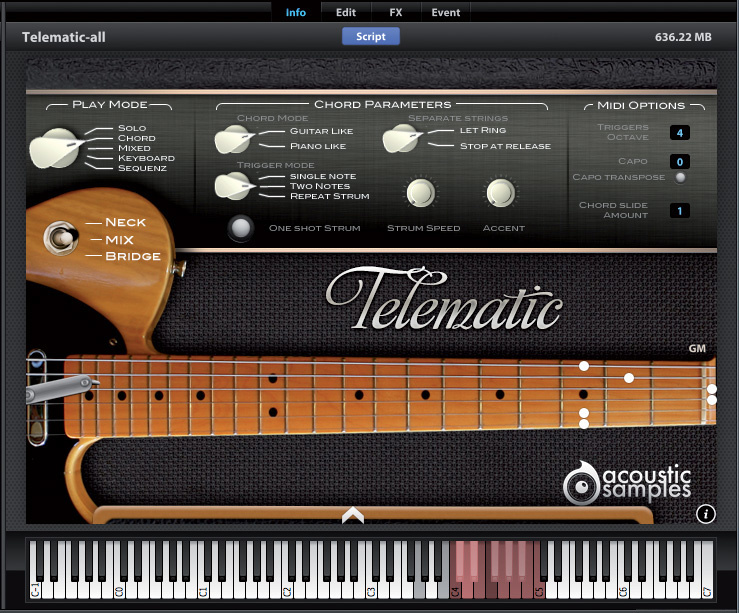 The most complex MachFive library is Telematic, an 8.3GB, 9500-sample Fender Telecaster behemoth. The full version gives you switchable neck and bridge pickup tones that are convincing 'out of the box'. But Telematic is just as much about the playing experience as the sound. A number of Play Mode variations combine with real-time chord recognition, sophisticated string allocation and damping, and specialised strum triggers. Getting the very best out of it takes a bit of practice and a thorough read-through of the encapsulated documentation, but it can sound amazingly realistic played from any old MIDI keyboard. It bears comparison with specialist products like MusicLab's RealStrat, in sound quality if not sheer flexibility. There's a great arpeggiator, hidden away somewhat with MachFive's other Event Processors. Underpinning all of MachFive's capabilities is a complex sample-management and synthesis architecture that is going to be of great interest if you like getting your hands dirty with sound design. I'd risk putting everyone to sleep with a full discussion of what's possible with the basic sound-containing unit, the keygroup. Suffice to say a program can effectively contain an unlimited number that can be combined in all manner of ways, such as stacked in layers, velocity switched, or controlled in real time with Layer Rules and Scripts. What's quite interesting is that, of the 12 'oscillator' types any individual keygroup can be set to, only one oscillator type, called Sample, actually loads up audio and plays it back (with looping and so on) in the familiar manner of old-school hardware samplers. Others offer Propellerhead REX-like, MIDI-triggered audio slicing, real-time pitch-shift and time-stretch (in standard, CPU-intensive and formant-corrected varieties), and granular synthesis. Several are based on algorithms licensed from the IRCAM institute in Paris. Then there's a bunch of synthesis oscillator-types that have nothing to do with sampling at all. There's a simple virtual-analogue oscillator, another that emulates an eight-oscillator stack, a noise generator, and a four-operator, FM-based homage to Yamaha DX synths. The Wavetable oscillator is wrongly named, because it doesn't actually have any 'tables', but it does offer some more harmonically complex tones derived from historical synths. Finally, there's an organ drawbar emulation, and an analogue-style pitch+noise drum synthesizer. Helpfully, many of these have a range of presets that can call up typical starting points for sound programming. You'll find an 'EP' preset for the FM oscillator, and 'Sync Unison Lead' for its Analog counterpart, for example. These are not whole synth patches, of course, but they get you going much quicker when you fancy doing some programming from scratch rather than just firing up the Biosphere soundbank. I always wanted a Fairlight... UVI's authentic-sounding Darklight will probably be the closest I'll ever get, even now.Having so many sound-generation starting points gives MachFive 3 a chameleon-like ability to adapt to whatever is required of it, in programming terms. But that, of course, is only the beginning, as each keygroup also carries its own independent synth architecture. And while it's not fully modular, it is potent. There are two filters in series and you choose the type of each from over 60(!) provided. That whopping provision includes low-, band- and high-pass designs in analogue-inspired and CPU-saving digital versions, along with an Oberheim Xpander filter emulation, positive and negative combs, and vowel filters. Modulation flexibility is similarly impressive. Almost any synth, effect or mixer channel-strip parameter can be independently modulated. The sources are many and varied, including performance controllers such as key velocity, aftertouch and modulation wheel, any incoming MIDI CC, and onboard Macro controls. You can have an unlimited number of LFOs and Envelopes, the latter coming in AHD, DAHDSR, Multi(point) and step-sequenced varieties. The LFOs have nine waveforms, a unipolar mode, and a bunch of additional parameters to control their static shape and behaviour over time. It's a similar situation with effects processing. Effects can be applied anywhere in the signal chain: to the Master Out, to shared mixer Auxes and individual parts, directly to a program, to a layer within that program, or even to an individual keygroup within a layer. In fact, it turns out that keygroups' filters are not really 'hardwired', but are just effects running at the keygroup level. You're free to change them or insert more. Want to insert a tape delay or reverb right into your sampler or synth voice signal path? You can. Running a separate reverb for every synth or sample voice could chew up CPU resources in the blink of an eye, of course, but the fact remains that it is possible. It's fair to say that MachFive should satisfy pretty extravagant synth programming needs, when it needs to. I've not yet mentioned much about Layer Rules or Scripting, and I'm not going to; they're more the domain of the sample developer than the average user. But suffice to say that these features extend MachFive's flexibility by another scale of magnitude. Layer Rules are typically used to provide access to keyswitched alternative articulations. Scripting is what makes complex instruments like Telematic tick, and MachFive's is based around the Lua open-source programming language. More generally accessible are the Arpeggiator and Microtuner Event Processors. These are really 'MIDI effects' that you work with via dedicated graphic interfaces in the Event view. The arpeggiator is a very flexible design, and easy to add to any part. Meanwhile, the Microtuner comes with a clutch of historical and world tuning presets, but you can define your own tunings or load up freely available Scala files. MachFive's effects bear comparison with those of many DAWs. There's a very healthy range on offer and some real crackers amongst them. Shown here is the excellent SparkVerb. A soft sampler or synth isn't worth a bean if it can't operate reasonably efficiently, and I'm pleased to report that MachFive 3 seems better in this respect than previous versions (which, admittedly, came out a very long time ago now). I did some testing in Presonus's Studio One DAW, with a 256-sample buffer in a 44.1kHz song. I instantiated one MachFive 3, loaded it with 16 parts — each a different sustaining stereo orchestral sound — and drove them all with MIDI clips that gradually built up a 16-note cluster. That's 512 voices in total (16 notes x 16 parts x 2 stereo voices per note). Studio One and MachFive reported slightly different CPU loads, 50 percent and 44 percent respectively, there was no hint of audio break-up, and my 2011 i7 MacBook remained responsive and apparently unruffled. Enabling four hall-length convolution reverbs and four algorithmic reverbs pushed up the load about another eight percent, and all was still well. In a typical rock arrangement of full-fat programs from the J-Bass, Telematic, F 278 and Star Drums soundbanks, I saw about 24 percent CPU load in Studio One. However, this setup caused my Mac to use all its 8GB of physical RAM, and for about the first 20 seconds of playing back the full arrangement there were hints of note choking and minor glitches. More RAM and a 64-bit DAW setup would be in order if you were planning to do much of this sort of work. I rebuilt the same kinds of arrangement in Kontakt 5, to get some perspective. A big orchestral template resulted in CPU loads about 10 percent lower on average, although on my Mac, at least, the CPU meter 'spiked' a lot more using Kontakt. Where Kontakt was notably more efficient was in adding effects. Enabling 16 of its convolution reverbs added only a few percent of extra overhead. Looking at MachFive's load times, results vary massively depending on the program you've chosen. Many from the Universal Loops & Instruments soundbank are up and running in a second or two. The same cannot be said for the flagship soundbanks, though. Loading from a dedicated external Firewire 400 7200rpm sample drive, J-Bass took 36 seconds to load, and Star Drums 39 seconds. F Grand was ready to go in 43 seconds, but Telematic took two minutes. There's no background loading feature, as in Kontakt, so you're really locked out of any work while MachFive crunches its data. Faster disks definitely improve the situation, however. From my Mac's internal SSD, the Telematic load time halved to 59 seconds. MachFive 3 is a big, ambitious virtual instrument with a lot going for it. The friendly user interface is a major strong point — it's easy to understand and genuinely welcoming. Day-to-day use, loading up and tweaking programs, is a breeze, and yet there's great programming depth available when you want it. Kontakt 5 feels a bit more fiddly and nerdy in comparison. The bundled sound library is comprehensive and often impressive, and with the synth, slicing and stretching chops taken into account you might decide MachFive covers all your sound-generation needs. Relatively modest CPU demands, coupled with today's sophisticated processors, might mean that you won't be needing to freeze parts very often either. Less impressive characteristics include those long load times, some silly unevenness in the library, and the odd playback glitch following loading. I also saw a couple of graphical bugs associated with editing and waveform display for the granular and stretch oscillators. Perhaps more of a concern for some will be the current level of third-party library support; a healthy library ecosystem is very much an affirmation of a sampler's success in the market, and the one surrounding MachFive is modest at best. It does look to be expanding, though, and already contains some interesting stuff. As for the iLok copy protection, well, it's a shame that an iLok is no longer supplied as standard, as it was with earlier MachFive versions. Beyond that, you'll have to make up your own mind. There are pros and cons. All things considered, MachFive 3 is an impressive and capable sampler. 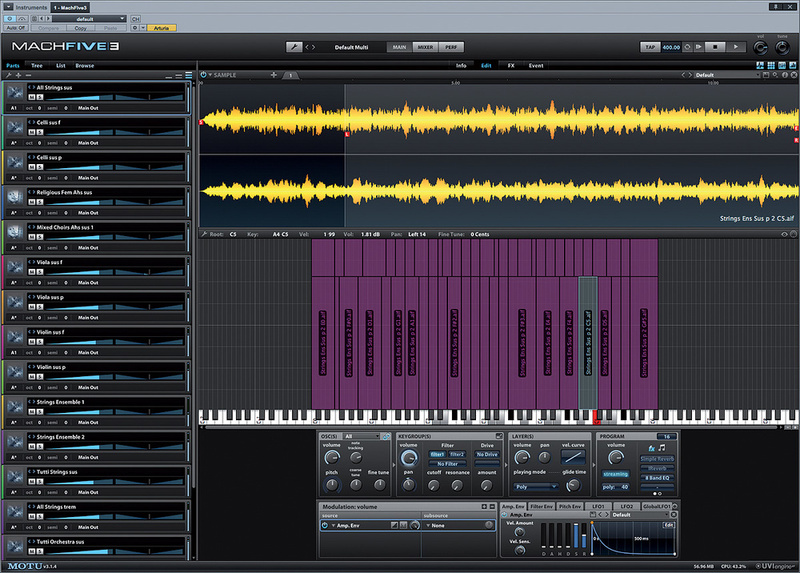 It's easy to learn and gets the sample-replay basics right. At the same time, it both invites and assists experimentation and programming. The interface and sound library have a reassuringly up-to-date feel, and it's flexible enough to fit in with many ways of working. It's a distinct alternative to Kontakt too, and that's healthy. There's something of a power struggle between MachFive 3 and Native Instruments' Kontakt 5, and certainly both have an essentially open-ended nature, colossal programming potential, and big bundled libraries. Kontakt has better third party library support, and feels notably fast, responsive and efficient. However, MachFive has an easier learning curve, and arguably a more varied and complete library. Don't overlook Steinberg's HALion, though; its synthesis and sample-manipulation facilities are directly comparable to those of MachFive. MachFive's bundled library can get you a heck of a long way, but for more specialised needs you'll want to look to additional native-format soundbanks to give you more scope. It's fair to say that MachFive does not enjoy the same industry-wide library support as Native Instruments' Kontakt or Logic's EXS24, but there's still a good bit out there. Some of the most interesting libraries come from MachFive's co-developer, UVI. Of particular note are their Darklight IIx Fairlight library and the Synclavier-based The Beast, which recreate the user interfaces of the original hardware. Then there's niche, quirky stuff like Acoustic Toy Museum, as well as reinterpretations of the Elka Synthex, Rhodes Chroma and Yamaha CS-series synths in the Vintage Legends suite. These run as true soft synths, using MachFive's oscillators, and are not sample based. They sound good, but tend to be heavier on the CPU than dedicated soft synths. More conventional sampled fare comes in the form of MOTU's Ethno (world instruments and loops), Electric Keys (vintage keyboards and organs), Symphonic Instrument (orchestral) and BPM (urban construction kits and loops) libraries. Although sold as self-contained stand-alone and plug-in instruments, their soundbanks load into MachFive in its native format, where you can edit and tweak them as much as you like. 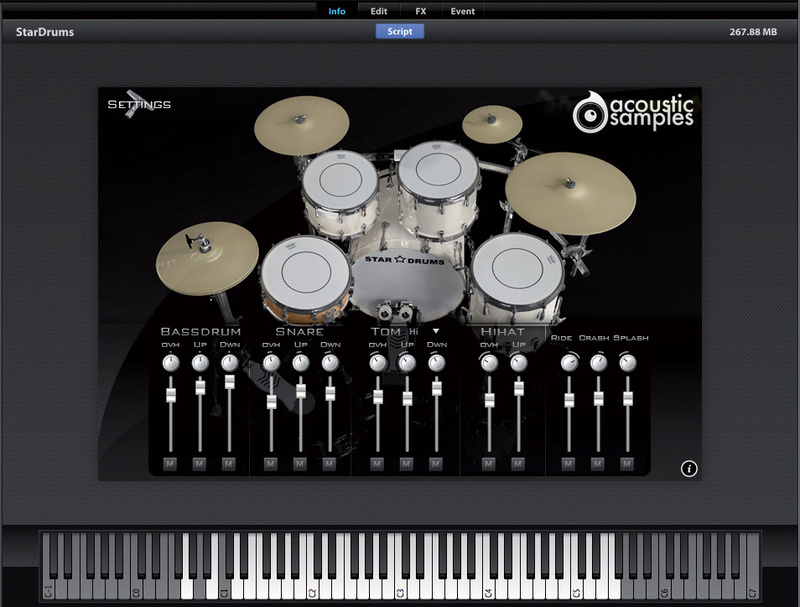 Other third-party developers include VI Labs, with their big trio of acoustic pianos, and Acoustic Samples. Some of their (and UVI's) separately available soundbanks form parts of MachFive's bundled library, and a quick root around their web site reveals electro-acoustic and jazz guitar equivalents of Telematic, amongst other things. What's a little odd, though, is that there are apparent overlaps between these MachFive 'family' developers. For example, UVI's String Machines soundbank looks suspiciously similar to part of MOTU's Electric Keys, to take just one example. When quizzed about this, UVI told me that some of their and MOTU's products share the same sample bases, but that there were differences in specific content, user interfaces and 'philosophy'. It's not as if there's deception going on here, but MachFive users looking to blow hard-earned cash on expanding their library provision would be wise to double-check they're not about to essentially duplicate what they already have. Beyond this, MachFive claims broad third-party compatibility with Kontakt 1 to 4, Gigasampler 1 to 3, EXS24 and GarageBand formats. Likewise, it'll have a go at your old Akai MPC or S-series libraries, as well as Emu Emulator III and IV, Kurzweil K2xxx, Roland S700, SampleCell and SoundFont formats — it'll even mount their CD-ROMs. Straight audio formats are, of course, supported too; AIFF, WAV, SDII, MP3, REX, ACID and (.AIF) Apple Loops. In testing, I had a generally good success rate for loading audio files, SoundFonts and a cross-section of the hardware-based formats. But for others, depending on the format you try, and even the individual library or preset, MachFive might do anything from completely refuse to play ball through to giving usable (but sometimes wacky) results. It's good that the breadth of compatibility exists as it does, but don't think for a minute that because you have MachFive you somehow also 'have' Kontakt or GigaSampler; that would be a long way from the truth. A notable feature of working with MachFive's effects is that their user interfaces are self-effacing to the point of blandness, which could unnerve users brought up on more photo-realistic fare. However, there's nothing amiss with the sound quality, which is high across the board. Six delays include dedicated Tape and Ping Pong designs with tempo-locked and absolute delay times up to 10 seconds. There's no multi-tap though. Reverb is catered for with CPU-saving and role-specific versions (such as 'Gate Reverb'), as well as a sumptuous convolution 'IReverb'. SparkVerb is a recent addition, and it's an artificial, sparkly and likeable algorithmic design. Amongst a clutch of Choruses and Flangers, the 'Ensemble 505' stands out as a great, vintage sounding ensemble. Other notable processors include a good rotary speaker emulation and various stereo wideners and controllers in the Amp/Stereo category. Drive and distortion are OK to these ears, without being jaw-dropping, there's a workmanlike compressor, and some multi-band dynamics tools that are short on metering but actually very good. To run MachFive 3, you'll need at least Mac OS 10.5.8, Windows 7 or Vista (SP2 or later) running on a 1.83GHz Intel Core Duo or better. For 64-bit operation, it's Mac OS 10.6 or later, a 64-bit CPU, and a compatible DAW. At least 4GB RAM is a sensible minimum, and a full installation occupies around 45GB of hard disk space. Inevitably, the faster the disk you can get the library soundbanks on, the better, and an SSD gives the best experience. Installation is from six DVDs, so you'll need an optical drive and a couple of hours to get everything across. You'll also need a free USB port for a version 1 or 2 Pace iLok dongle, which is not supplied, so add another £35$50 or so to the budget if you don't already have one. Finally, for plug-in use, your DAW must support VST, Audio Units or RTAS format. Versatility and programming depth delivered through an uncomplicated, user-friendly interface. Also a formidable soft synth, loop player and audio manipulator. The bundled library and effects are largely very good and cover tremendous range. CPU efficiency is on a par with the competition. You can plan tea breaks around some program load times. Third-party libraries are still comparatively thin on the ground. Import of other sample formats is hit and miss. The odd bug and performance glitch. MachFive 3 is a world away from previous versions, and better in all respects. There's still room for improvement in some aspects of operation and library provision, but it now bears comparison with anything else on the market, and comes out on top in many areas. MachFive 3 £349; upgrade from previous version £138; upgrade from other software sampler £249. Prices include VAT. 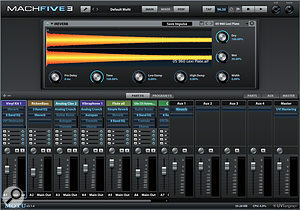 MachFive 3 $495, upgrade from previous version $179, upgrade from other software sampler $295. MOTU +1 617 576 2760. 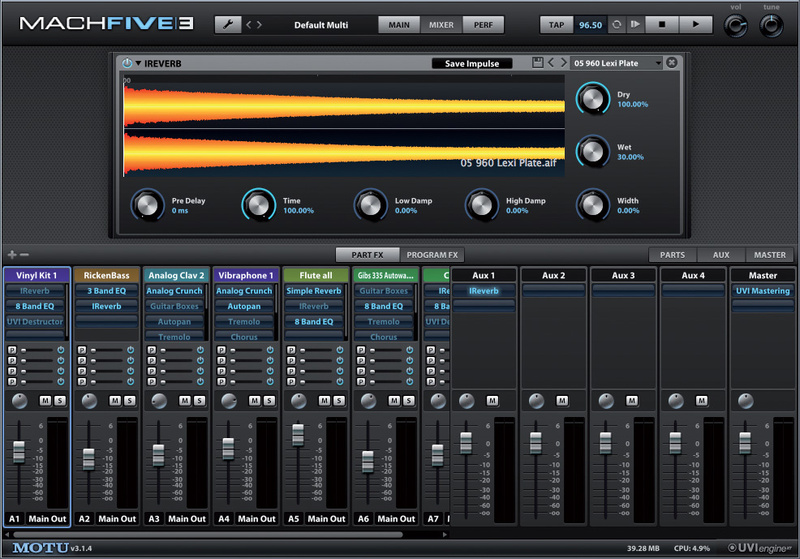 MOTU MachFive 3.1.4 stand-alone and plug-in (hosted in Studio One Pro 2.5.1). 2011 MacBook Pro 2.2GHz Intel Core i7 CPU with 8GB RAM, running Mac OS 10.8.2.